I’m always on the lookout for easy side dishes that are out of the ordinary. This came from a desire for something Italian that wasn’t the same old spaghetti marinara. And it was a way to incorporate some of the basil growing on my windowsill. Boil pasta until al dente. As the pasta cooks, combine the flour and oil to make a roux over medium heat. Grate the onion and garlic into the roux and cook for 2-3 minutes until fully incorporated and beginning to cook through. (Alternately, add finely chopped onion and garlic to the roux and cook for a bit.) 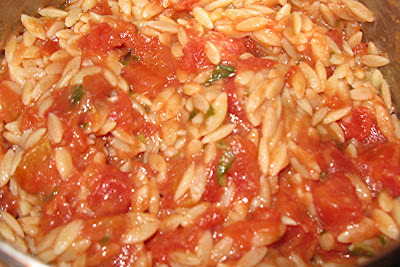 Stir in the tomatoes and cook until the sauce thickens (5-8 minutes). Add the drained pasta and basil and toss together. Top with grated cheese as desired.